It’s a common tale, you planted a few cattails in the shallow edges of your backyard pond and now you have a dense stand of cattails blocking your view and access to your shrinking pond. 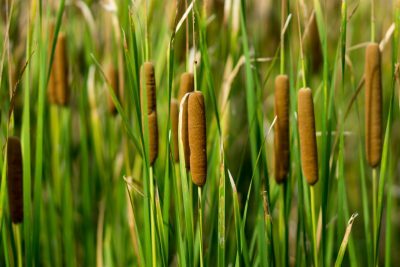 Cattails spread vigorously through underground rhizomes and seeds that seem to germinate as soon as they land in the water. 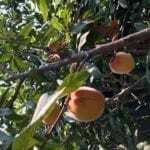 They can also choke out other pond plants with their aggressive rhizomes and tall height that shades out smaller plants. On the plus side, cattails are one of the best natural filters for ponds, lakes, streams, etc. As they filter waterways, they take up valuable nutrients that can be used as soil amendments and mulch. Continue reading to learn about mulching with cattails. Many species of cattails are native to the U.S. However, a lot of the more aggressive species we see in waterways now are introduced species or species that came into existence by natives and introduced species cross pollinating. For centuries, Native Americans used cattails for food, medicine and as a fiber for various items like shoes, clothing and bedding. Leftover remnants of the plant were then worked back into the earth. Presently, cattails are being researched for use as ethanol and methane fuels. Cattails as mulch or compost provide carbon, phosphorus and nitrogen to the garden. Cattails grow and reproduce quickly, making them a valuable renewable resource. As natural pond filters, they absorb fish and amphibian waste, which also benefit garden soil. Another benefit is that cattail seeds will not germinate in the garden, like many plants used as mulches can unfortunately do. The main drawback to making mulch from pond plants is that it can be rather unpleasant smelling to work with. 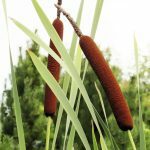 Also, cattails are considered protected species in some areas and invasive species in other locations, so know your local laws before removing or planting wild plants. Cattails have a history of being used as a durable fiber. What this means when considering mulching with cattails is that it does not break down quickly or easily. If you are planning on using cattails as mulch or in the compost pile, you will need to chop it up with a mulcher or mower. Mix in wood chips and/or yarrow plants to speed up decomposition. Cattails growing in ponds will probably need some manual control once a year. 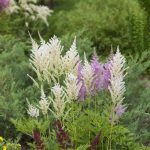 The best time to do this is midsummer when the plants have had time to store up valuable nutrients but are not yet spending them on seed production – if you are planning to use them as mulch or compost. Cattails can be pulled out by hand or cut below water level to control and utilize them. If you have a large pond or plans to mulch/compost cattails on a grand level, they can be dredged out with heavy equipment. Again, be aware of local laws regarding cattails before doing anything with them.